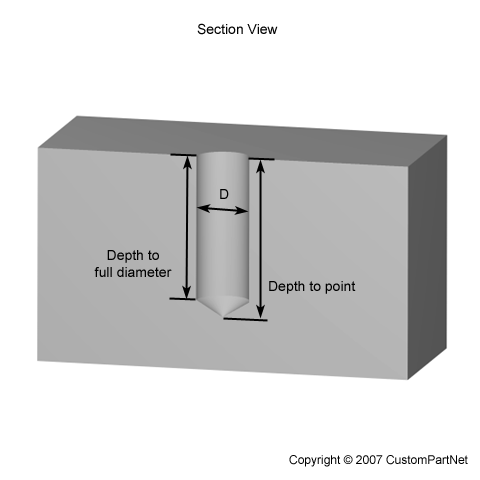 The amount of force required to deep draw a sheet metal blank to a smaller diameter determined by the punch. The required force will depend upon the material, sheet thickness, and drawing ratio. The drawing force will create enough stress in the material to exceed the tensile yield strength, allowing the material to plastically deform to the new shape. The percentage of the production quantity of parts that are defective. These parts can be discarded or recycled. The ratio of a material's mass to its volume at a given temperature and pressure, typically measured in kg/m^3, g/cm^3, or lb/in^3. Water is 1.0 g/cm³ at 25°C and 1 atmosphere of pressure. Die casting machines can be classified as one of two types – a hot chamber or a cold chamber machine. Hot chamber machines are used for alloys with low melting temperatures, such as zinc. Cold chamber machines are required for alloys with high melting temperatures, such as aluminum, and have longer cycle times and higher hourly rates. Also called the permittivity and denoted DK, or Er. The ratio of the capacitance of an insulator to the capacitance of a vacuum or dry air (the dielectric constant of a vacuum is 1.00000, dry air is 1.00054). Capacitors release charge when a circuit is broken. Capacitance is the ratio of charge absorbed to the potential (voltage applied). A dielectric constant of 3 means an insulator will absorb 3 times more electrical charge than a vacuum. The maximum voltage an insulating material can withstand before breakdown occurs. Imperial units are in volts per Mil and Metric units are in kilovolts per mm. The number of cycles performed during the casting process before the wear on the die is too much for it to be used anymore. If the die life is shorter than the number of cycles needed to produce the production quantity of parts, additional dies will be needed. However, a die can be repaired to slightly extend its lifetime. The die life is affected by both the material of the die and the material being injected. The offset of the walls of a part by a slight angle, referred to as the draft angle. 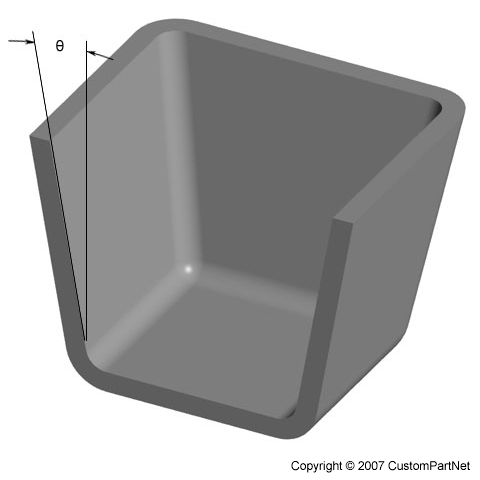 A draft angle is often required on the surfaces of a part that are parallel to the tooling direction in order to facilitate removal from a mold. However, some processes do not require a part to have any draft. A measure of the severity of a deep drawing operation, calculated as the ratio of the blank diameter to the punch diameter. 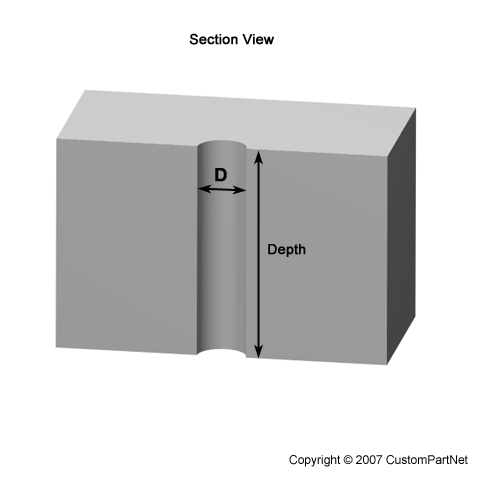 The limiting drawing ratio (LDR) is a measure of a material's deep drawability and is calculated from the largest blank that can be completely deep drawn for a given punch diameter. The percent reduction of the diameter of a sheet metal blank to the draw diameter (or punch diameter) through a deep drawing operation. The complete deep drawing of a part is often achieved by a series of draw reductions. 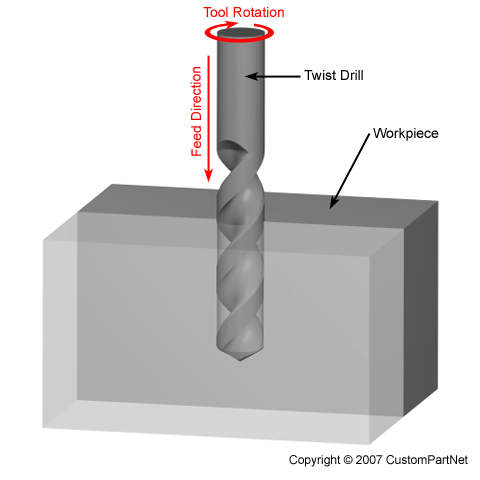 An operation in which a drill enters the workpiece axially and cuts a hole with a diameter equal to that of the tool. On a milling machine, an end milling operation is required to produce a hole with a tool smaller than the hole diameter. 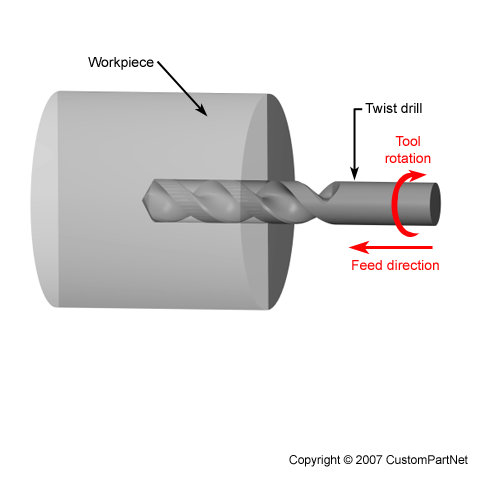 A drilling operation typically produces a blind hole, which extends to some depth inside the workpiece, measured to the point made by the tool or to the end of the full diameter portion. On a milling machine, a hole that extends completely through the workpiece (through hole) can also be drilled. The cycle time of a process that results from no material or workpiece being used. The dry cycle time is typically a measure of machine performance that indicates the time for the machine to perform the actions necessary to manufacture a part, without the part actually being produced. This time will always be less than the actual cycle time.